In addition to racing, Collins' company Collins Autosport Limited provides precision and stunt driving services, particularly for BBC Television, including Top Gear and Top Gear Live, as well as for the film industry, such as driving James Bond's car in Quantum of Solace and Casino Royale, and Eve Moneypenny's car in Skyfall. 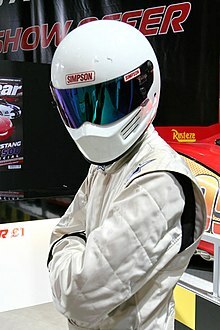 In August 2010, several British national newspapers reported on an allegation made by The Sunday Times that Collins may be one of the identities of The Stig—an otherwise unidentified presenter on the Top Gear show—on the basis of financial filing made by the Collins Autosport company. On 1 September 2010 the BBC was refused a court injunction preventing Collins from publishing an autobiography revealing himself to be The Stig. On 1 October 2010, it was announced that Collins would join Fifth Gear as a presenter. In 2012 Collins joined as co-presenter of Polish TVN's Automaniak. In February 2014, he was added to the 'Drivers Club' of the newly formed Formula E series, but did not compete in the inaugural 2014–15 season. Collins was born in Bristol, but spent the first ten years of his life in California in the USA, where his father worked for a distribution company. Collins was educated at Blundell's School and after studying law at the University of Exeter, he spent around four years serving in the British Army, serving some of his time as a Special Forces driving instructor. His racing career started in 1994. He worked for Hornby as brand manager of the Scalextric model slot car division. As of 2010[update] Collins continued to live in Bristol. Collins has competed in motorsport since 1994. In 1995 he competed in Formula Vauxhall Junior, finishing third overall with two wins and eight podiums. He also competed in the Formula Opel Winter Series, placing second overall driving for Sir Jackie Stewart who commented in Autosport Magazine, "When you see the likes of Ben Collins in Formula One, remember you saw them here first". Collins moved onto the British Formula 3 Championship in 1996. In 1997, he finished eighth in the standings driving for Fortec Motorsport, and also finished eighth in the Macau Grand Prix. After another year in Formula Three in 1998, Collins raced in the American Indy Lights series in 1999, finishing thirteen in the standings. For 2000, he returned to British F3 to drive for Carlin Motorsport, once again finishing eighth. He also finished second in the 2000 Masters of Formula 3 race at Zandvoort. Collins has been a test driver for racing manufacturer Ascari during Ascari A10 development, and undertaken testing of Formula One cars. In 2003, Collins raced in the ASCAR European Oval racing series with RML, winning six races on his way to being crowned champion. He continued racing in the series in 2004. Collins returned to sportscars in 2005 to race in the British GT Championship and FIA GT Championship with Embassy Racing. In 2006 he rejoined Ascari, racing in the FIA GT3 European Championship. In 2007 Collins tested a NASCAR Cup Series car at Lakeland Speedway with the Red Bull Racing Team. In 2009 Collins was named as an endurance driver for Australian V8 Supercars team, Kelly Racing/Jack Daniel's Racing, partnering with Nathan Pretty. Collins competed in the final meeting of the 2010 Dunlop MSA British Touring Car Championship, driving a BMW for the Motorbase Performance team. He finished his first race in 14th and bettered that with a 12th in his second. However he retired in the third and he never returned the following season. Collins is a regular writer for Autosport Magazine testing the latest racing cars, has written for The Sunday Times, fronted Sky Sports' televised NASCAR coverage, along with appearances on the British car-focused television programmes Top Gear (BBC Two), Pulling Power (ITV1) and driven (Channel 4). He worked as a precision-driver in the film National Treasure: Book of Secrets where he doubled for the actor Nicolas Cage and drove in some of the high-speed sequences in London. As a precision-driver in the 2008-film Quantum of Solace, Collins drove James Bond's Aston Martin DBS as a stunt double for Daniel Craig in the lead role. He has also worked as a stunt driver on Skyfall and Spectre. He also holds a World Record for the maximum distance of driving a car on two wheels (a manoeuvre called "skiing"). Collins presented television programme Xtreme Teen Drivers, shown on BBC Three on 15 December 2007; as an advanced driving instructor within the programme, he was trying to teach a young boy racer to drive more safely. Collins' company Ben Collins Auto-sport has provided its logistics and third-party liability insurance for prize-winner track day events promoted by Top Gear magazine. In 2004, Collins made an appearance during the fourth season of Top Gear, alongside parachutist Tim Carter. The stunt involved Carter and an aerial cameraman jumping out of a Cessna light aircraft then landing in the open-topped Mercedes car being driven at a speed by Collins. The open-top car was introduced as belonging to Collins and had earlier been used, driven by The Stig, during a wig test in Series 3 Episode 5. In 2004, the driver featured during series five, driving a Lancer Evo VII and then a Bowler Wildcat vehicle in a rally race against mountain boarding world champion Tom Kirkman. Collins also appeared in the Top Gear Special, '50 Years of Bond Cars', on the set of Skyfall. Collins, who worked as a stunt driver on the film was interviewed by Richard Hammond. On a separate occasion, following an accident involving Richard Hammond in September 2006, the Health & Safety Executive report into the event recorded that Collins had "worked closely with Top Gear as a high-performance driver and consultant" and had prepared a briefing for Richard Hammond preceding the event. On 19 January 2009, British newspaper The Daily Telegraph ran a story claiming that they had "outed" Collins as being one of the people behind the white-suit incarnation of The Stig, at the same time noting that "Collins, from Bristol, has always denied being the Stig". The Times, in a follow-up article, stated that the "identity of the white-suited Stig ... has been an open secret within the motoring world for some years, with newspapers refraining from publishing his name, to uphold the spirit of the programme" which concluded that "a newspaper broke with the convention to out Mr Collins, 33, after following up a story in a Bristol newspaper". Similar allegations were repeated by The Sunday Times during August 2010. Two Bristol-based local newspapers had published articles a week before The Times in January 2009, on the basis of information leaked from a local art gallery. Collins had previously commissioned a Clifton-based business in September 2008, to produce a limited-edition run of 450 poster prints to be sold for £318 each. Collins had initially portrayed himself as a BBC marketing executive and only confirmed a more detailed connection to the Top Gear show after the signing of confidentiality agreements by the business owners. The signed poster image showed a salt flat scene, with The Stig positioned standing on it. However, at the time Top Gear presenter James May claimed that the Stig's identity had not been outed. There had been speculation that there may have been more than one person who plays the Stig. In an exclusive interview with WitneyTV recorded on 3 September 2010 and broadcast on 7 September 2010, Top Gear-presenter Jeremy Clarkson confirmed that Collins had worked as The Stig, and that Collins was "history as far as we're concerned, he's sacked". On 7/8 September 2010, The Guardian, The Sun and other papers re-reported Clarkson's assertions in the interview that Collins had been fired from his role on the television show. Collins stated that he had started writing an autobiography during Christmas 2009 as he feared that he might lose his contract on the show. Collins stated that he had gone to great lengths in order to conceal his work on the television show, including parking in separate locations and wearing a balaclava while travelling to the filming sites. In the fifteenth series Christmas special, Top Gear presenters referred to the Stig as "The Splitter" and publicly ridiculed the Stig, using the picture of the Stig for drive-by shooting targets. During Collins' appearance with the military amputees broadcast in July 2011, Collins was introduced and acknowledged by Top Gear-presenter Richard Hammond as "ex-Stig ... Ben Collins". Though Hammond still referred to Collins as a "romantic novelist", he said that "to be honest, [he was] quite glad to see 'the old Splitter' back, and [he does] know how much giving these guys a hand means to him. So this is all right." In his appearance in the Top Gear Special, '50 Years of Bond Cars', Collins was wearing a T-shirt on which was printed the words, "I AM THE STIG." Richard Hammond, (who interviewed Collins) reacted, saying to him, "Nice T-shirt by the way." Collins admitted that he needs to "update that a bit", pointing to the word "AM", to which Hammond exclaimed, "Was." After hearing about some of what Collins had been doing for the film, Hammond remarked, "You should write a book." Collins joined the presenting staff of Channel 5's Fifth Gear in Series 18, participating in racing challenges on several occasions. He did not return to the cast for Series 19. Despite his removal from Top Gear, Collins has subsequently appeared on the "Top Gear Live" touring show. He appeared onstage in a show in Poland and also served as a racing driver for at least one pre-recorded clip. Introducing him, Clarkson joked Collins' was "living rough", in a racing track paddock, as Collins was shown to be sleeping on cardboard with a shopping trolley with books and Daniel Craig face cuttouts for his possessions. Collins' role was identical to his previous one as the Stig, except wearing an open face helmet and he was referred to as "The Ben Collins" by Clarkson. He has written a second book, How To Drive: The Ultimate Guide, from the Man Who Was The Stig, published in 2014. Collins served as a consultant during the development of Project CARS and Project CARS 2. ^ Speedsport Magazine, Race Driver Database: Ben Collins. Retrieved 15 March 2008. ^ "Index entry". FreeBMD. ONS. Retrieved 13 December 2016. ^ a b c d e Syson, Neil (23 August 2010). "Ben's the Stig? That figures..." The Sun. Retrieved 23 August 2010. ^ a b Bloxham, Andy (22 August 2010). "Stig mystery: financial documents suggest identity of Top Gear driver". Telegraph. London. Archived from the original on 23 August 2010. Retrieved 23 August 2010. ^ a b c d Siddique, Haroon (22 August 2010). "Top Gear driver unmasked as Sunday Times lifts helmet on Stig's identity". The Guardian. London. Archived from the original on 24 August 2010. Retrieved 23 August 2010. In December 2003, .. based partly on "driving services provided for the BBC, mainly in the Top Gear programme". ^ a b c "Who is the Stig? The answer". The Daily Telegraph. UK. 19 January 2009. Archived from the original on 21 January 2009. Retrieved 19 January 2009. Top Gear test driver the Stig has been unmasked as professional stuntman and Le Mans racer Ben Collins. ^ a b Foster, Patrick (19 January 2009). "Identity of Top Gear's The Stig revealed as Ben Collins". The Times. UK. Retrieved 19 January 2009. ^ a b c d Kelly, Tom (23 August 2010). "The Stig unmasked... by his own company accounts". Daily Mail. London. Archived from the original on 23 August 2010. Retrieved 23 August 2010. A BBC spokesman said: 'It's no surprise that Ben Collins's company accounts show that he was driving for Top Gear as he has appeared on the programme as himself, for exam-example [sic] in the Mitsubishi evo challenge. ^ Hewage, Tim (1 September 2010). "Top Gear's The Stig Is Finally Unmasked". Sky News. Archived from the original on 4 September 2010. Retrieved 1 September 2010. ^ Sweney, Mark (10 January 2010). "'The Stig' joins Channel 5's Fifth Gear". The Guardian. Archived from the original on 1 October 2010. Retrieved 1 October 2010. ^ "Nowy sezon "Automaniaka" z legendarnym Benem Collinsem!". Tvn.pl. 11 November 2013. Retrieved 31 January 2015. ^ "Alguersuari, Minassian & Klien add names to Formula E Drivers' Club". Archived from the original on 8 May 2014. Retrieved 29 October 2015. ^ Jackson, Ben (11 September 2010). "Ben Collins: My life as The Stig". The Sun. Retrieved 15 September 2010. ^ a b c d O'Grady, Sean (23 August 2010). "So he's really the Stig? Big deal". Independent. London. Archived from the original on 24 August 2010. Retrieved 23 August 2010. ^ Pfanner, Eric (12 September 2010). "BBC and News Corp. Sharpen Attacks in Top Gear Scuffle". New York Times. Retrieved 12 September 2010. ^ "Collins Autosport: Racing History". collinsautosport.com. Collins Autosport. Archived from the original on 25 August 2010. Retrieved 24 August 2010. ^ "Ben Collins". Lucas Alexander Whitley. Retrieved 29 October 2015. ^ a b "Ben Collins career statistics". driverdb.com. Driver Database. Retrieved 24 August 2010. ^ Surface Transforms Plc, Case Study: Ascari A10 Archived 14 January 2009 at the Wayback Machine. Retrieved 12 June 2008. 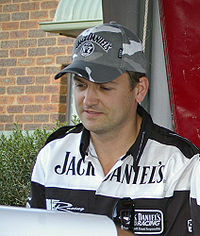 ^ "Ben Collins joins Jack Daniel's Racing". Motorsport. Retrieved 29 October 2015. ^ "1000km Algarve Race results". AutoMobilSport. Retrieved 22 September 2017. ^ "Blockbuster Movie Uses the CG-Lock" (PDF). CG-Lock. 10 January 2007. ^ "HarperCollins in Top Gear Stig legal wrangle". BBC News. 23 August 2010. Archived from the original on 23 August 2010. Retrieved 23 August 2010. appeared numerous times on the programme and he often supplied other drivers for both the programme and Top Gear Live. ^ Crash.net, Reigning champion stars on BBC Top Gear Archived 15 March 2008 at the Wayback Machine, 27 July 2004. ^ a b c d "Has The Stig been unmasked at last?". Evening Post. Bristol. 23 August 2010. Archived from the original on 26 August 2010. Retrieved 24 August 2010. ^ "Calstock's own World champion". www.bbc.co.uk. Retrieved 26 January 2008. ^ "Top Gear: Skater". www.youtube.com. Retrieved 7 May 2008. ^ "The Stig" (PDF). Sainsburys. Archived from the original (PDF) on 5 March 2016. Retrieved 29 October 2015. ^ a b Hogan, Michael (31 July 2011). "Top Gear, episode 6, review". The Telegraph. Retrieved 1 August 2011. ^ "Investigation into the accident of Richard Hammond". www.hse.gov.uk. ^ a b c "Top Gear's The Stig reveals identity to Bristol gallery owners". Western Daily Press. 6 January 2009. Archived from the original on 23 January 2009. Retrieved 19 January 2009. ^ a b "Top Gear's The Stig revealed to Bristol firm". Bristol News. 6 January 2009. Archived from the original on 23 January 2009. Retrieved 19 January 2009. ^ Lampert, Nicole (4 September 2010). "Losses of £1m, three children in three years and a lifetime of frustrated ambition... why The Stig REALLY unmasked himself". Daily Mail. London. Archived from the original on 6 September 2010. Retrieved 4 September 2010. ^ Allen, Nick (23 January 2009). "The Stig's true identity is still a mystery, claims Top Gear's James May". Daily Telegraph. London. Archived from the original on 31 January 2009. Retrieved 24 January 2009. ^ "Top Gear creator's original Stig living in Sydney". The Australian. 13 September 2010. Archived from the original on 14 September 2010. Retrieved 12 September 2010. ^ Conlan, Tara (7 September 2010). "Jeremy Clarkson: the Stig is 'sacked'". The Guardian. London. Archived from the original on 10 September 2010. Retrieved 11 September 2010. ^ "Clarkson: Stig sneak is sacked". The Sun. 8 September 2010. Retrieved 11 September 2010. He's history as far as we are concerned. He's sacked. ^ Jackson, Ben (10 September 2010). "The Beeb branded me a dalek and bullied me out of the Stig job". The Sun. Retrieved 11 September 2010. ^ "Stig Ben Collins: Jeremy Clarkson told me I drive like a homosexual... but he wouldn't last 60 seconds in my job". Daily Mail. 11 September 2010. Archived from the original on 12 September 2010. Retrieved 11 September 2010. ^ "The book the BBC tried to ban: Ben Collins on the day Top Gear's Stig met Jordan". Daily Mail. London. 13 September 2010. Archived from the original on 15 September 2010. Retrieved 15 September 2010. ^ Hammond, Richard. "Hammond, Clarkson and May found a new racing driver". YouTube. Richard Hammond. Retrieved 5 October 2016. ^ "How The Stig traded in his white helmet for an Oculus Rift and Project Cars". 26 May 2016. ^ "Ben Collins On Why Project Cars 2 Is The Best Racing Sim Yet". 16 February 2017. Wikimedia Commons has media related to Ben Collins (driver).